Recently I did a big breakdown on how Florida distributed the ball through the air in 2018. Today it’s time to see how it worked on the ground. 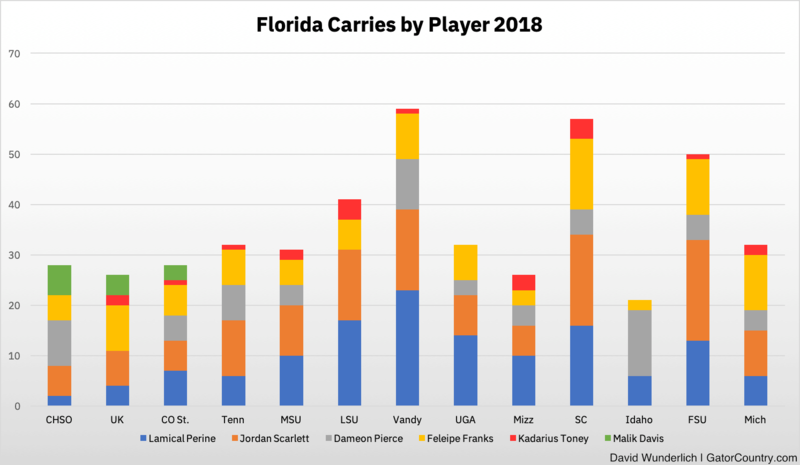 I included the top four running backs, Feleipe Franks, and Kadarius Toney in my charts. Franks’s totals do not include sacks, which are counted as rushes in the official NCAA stats but aren’t truly run plays. It was a tough call whether to include Malik Davis and Emory Jones, and I put in the former but not the latter. I threw Davis in there since he was a part of the real (i.e. non-garbage time) running back rotation prior to his injury, while Jones was a specialty player who only appeared in four games and was not a part of the normal offense. Even though Jones finished with more carries than Davis did, this is what made sense to me. As I did in the receiving piece, I made stacked bar charts for the players in question. Here is how it worked for just carries. It’s remarkable somewhat that Lamical Perine ended up the team’s leading rusher by carries even though he only had the most rushes in one of the first four games. Jordan Scarlett getting no carries against Idaho (he had one reception) was a big factor in that, though. Scarlett was the favored back early and late, with Perine getting a surge in the middle. Perine’s share of the carries among those two actually peaked against Georgia; it only looks like Vandy because the Gators ran 92 plays in that game and everyone got a lot of work. It’s hard to take much away about Davis since two of his games went to garbage time quickly, and UF only ran 44 plays in his last thanks to non-offensive touchdowns. He had the same number of carries (four) as Perine did against Kentucky, and he was used with Scarlett in the first two-back sets of the season against Colorado State. There was an early lean towards running with Scarlett, as I mentioned, but Davis was even with Perine before getting hurt. I saw some people make something of the fact that Franks had double-digit carries in the final three FBS games of the year. When you see how many rushing plays the Gators had against South Carolina and FSU, the totals seem less important. In fact, Franks had between 14.6% and 22% of the carries among this set of players in eight of 13 games. He was below that threshold against Missouri, when the team was behind and throwing a lot, and Idaho, when it made no sense for him to take hits. He was barely above it at 24.6% against the Gamecocks and up around 34.5% against both Kentucky and Michigan. 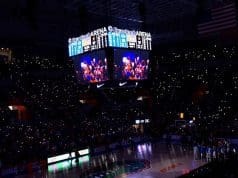 The circumstances of the UK and UM games were quite different, to say the least. The run game with Scarlett, Davis, and, early on, Perine wasn’t working well against the Wildcats, so Franks got more carries. Against the Wolverines, quarterback runs were a known issue for the defense that Dan Mullen exploited. Toney’s usage was varied and never that heavy, as he topped out at four carries in any one game. That was largely his story as a receiver too. Here is the same kind of chart but for yards instead of carries. The excitement for Dameon Pierce in September is easily seen here. He understandably got the most carries of the running backs against Charleston Southern, and he did pop off runs of 12, 19, and 27 in that game. He then had those memorable long touchdown runs of 68 on Colorado State and 47 against Tennessee to put exclamation points on those wins, albeit long after the games were over. Outside of those five explosive plays, he had only five runs of 10+ yards the rest of the way. Three of them came against FCS Idaho, just like three of the ones I mentioned above came against FCS Charleston Southern. His yards per carry rate for the whole season drops from 6.1 to 4.6 without the two long touchdown runs against the Rams and Vols, and he topped out at 3.8 yards per carry in any single game against Power 5 opponents after the bye week. Though Pierce did get a few carries while games were in doubt, much of the drop off is that the backup offensive line was only consistently good at blocking against FCS teams. That doesn’t bode well for 2019 unless John Hevesy can work some magic this offseason. Once Perine became a major part of the rushing offense against Mississippi State, he and Scarlett combined for at least 100 yards in six of the final nine games. The misses were that game against Mississippi State’s elite defense, the face plant against Missouri, and the Idaho game where Scarlett didn’t get a carry. Franks mostly ran up modest totals except for the 48 yards he had in that extensive work against Kentucky. In those final three FBS games when he had more than ten carries in each, he also had at least 50 yards in each. 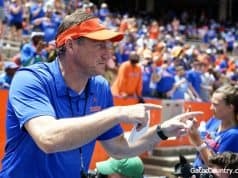 Mullen has a reputation of running the quarterback just to run the quarterback, especially in a stressful game. That may have happened against Kentucky to a degree, as Franks had 3.8 yards per carry and a 25% success rate outside of a 21-yard rush, but it wasn’t happening late in the season. Even with his 3.9 yards per rush against South Carolina, that went with a 50% success rate. Excel happened to assign Toney the color red in the chart, but it kind of works to make his output the cherry on top of the rushing attack as opposed to a main component. That pretty much is what he was. His lowest yards per carry rate in any game was 5.0, which happened against Kentucky (two for 10) and FSU (one for five). Toney had nine yards per carry or more in six games, including outings against Tennessee (one for 34) and Vandy (one for 27) where he was only allowed to contribute a single explosive run. He didn’t even get to carry the ball against Georgia once. It’s possible that some of his success came down to his infrequent use; more carries means more opportunity to regress to a more modest mean and more film to see how he might be used. Even so, it’s hard to argue that he doesn’t deserve more chances to run with the ball next year. Here’s a quick summary of the main rushing stats for these players. Pierce shows up between Perine and Scarlett, but again, that’s due to his two long garbage time runs. Without them, he’s a tenth of a yard below Davis at 4.6. Running a lot behind the backup offensive line, even sometimes against backup or FCS defenses, was a clear step down from going behind the starters. Perine has a little of that effect too. He had a run of 74 against FSU and a run of 53 against Michigan. The 74-yarder was while the game was in doubt, but the latter was in the fourth quarter while the Gators were up 27 points. Without that one long carry against the Wolverines — which by itself accounts for the year-long yardage difference between the top two running backs — Perine drops to 5.8 yards per carry (it’s 5.3 without the long FSU run, if you’re curious). He and Scarlett essentially were interchangeable, and rotating them every drive to keep them fresh made sense. Having two primary running backs with a yards per carry rate close to six was not something I would’ve predicted before the season. Aside from Davis’s abbreviated, seven-game season in 2017, you have to go back to the Rainey/Demps days to find a top-two back in terms of carries as close as 5.8 yards per rush. Florida’s recent offensive lines haven’t been good enough to get backs that many yards per carry, and even when it did, it was those super speedy guys who had breakaway runs that skewed their YPC rates higher. As for Davis, it’s hard to rate things. He looked tentative early, which is understandable for a guy who was coming back from a bad injury on an ambitious time schedule. He was spectacular behind a worse offensive line in 2017, so he has good production in him. Or, at least, he did before his two consecutive season-ending injuries. I enjoy watching him so I hope he comes back full strength, but we’ll have to take a wait-and-see approach on him. 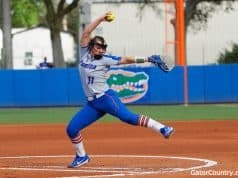 Franks was nothing more than fine as a runner much of the way until his benching against Missouri seemed to light a fire under him. After that he consistently became that willing runner Mullen was looking for, something that only helps entrench him at the top of the depth chart. More so than in the receptions breakdown, Toney’s line here cries out for greater action in 2019. Mullen talked after the South Carolina game about how to get him the ball more, and he did have seven targets in the next game against Idaho and four combined targets and carries in each of the FSU and Michigan games. That was the most usage Toney had in any three-game stretch in 2018, but really, he needs more action. As for rushing in 2019, at first I’ll bet it looks similar to the beginning of 2018. Perine is easily RB1, but Davis and Pierce have probably shown enough to get regular carries too. Davis’s recovery from a 2018 broken foot should take considerably less time than coming back from his nasty 2017 knee injury did, so he should get himself up to speed well before fall camp. Remember that he, not Perine, was the pick to complement Scarlett in those two-back sets early on. Mullen liked him enough to have him carry the ball the same number of times in the first three games as Perine did, so I think he’ll be up there. 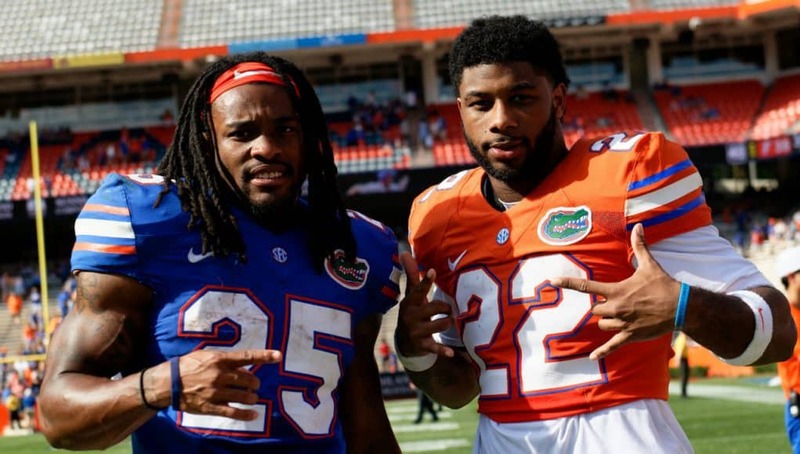 Florida passed a lot at the beginning of 2018, though, so no one seemed happy with the three-headed rotation at tailback. That combined with only getting 44 plays to divvy up among the entire offense against Colorado State generated a lot of frustration in the fan base. We could be in for that again because the offensive line has a lot to prove. Franks got a lot better in 2018 at avoiding sacks even while the line was leaky early on, so that could lead to a repeat of the pass-heavy September. Though Franks really did come through in heavier usage late, it’s worth noting that the matchups were a big part of that. He did a ton of reading (and did it almost flawlessly) against Florida State, so his high carry count there had a lot to do with how the defense played the Gators, and Michigan had that weakness to the quarterback run. He may get a few more carries than in 2018, but they’ll be highly situational. Toney should get more carries. Like, a lot more. He probably won’t because Mullen, being something of a control freak as most coaching savants are, doesn’t like how much Toney freelances. Alas. The biggest question I have is how often we’ll see Emory Jones before garbage time. The packages they make for him to run are useful, but they’re not as necessary if Franks keeps his aggressive running up. Without needing to hold Jones to four games or less, Mullen will almost certainly use him more often. I just wonder if it’ll be more than three or four plays on one drive like we saw in non-Idaho games in 2018. All of this goes out the window if something happens to Franks and Jones takes over. While Jones showed flashes of good passing ability last fall, him being a more gifted runner means more quarterback runs and options. We’ll see if Iverson Clement or Nay’Quan Wright can steal some carries, but the running back position is so stacked that the latter will probably redshirt. Clement might appear as something of a third down back or passing game specialty, but there’s not really a good way to do a four-running back rotation. His time to get more substantial use is probably 2020 after Perine graduates. 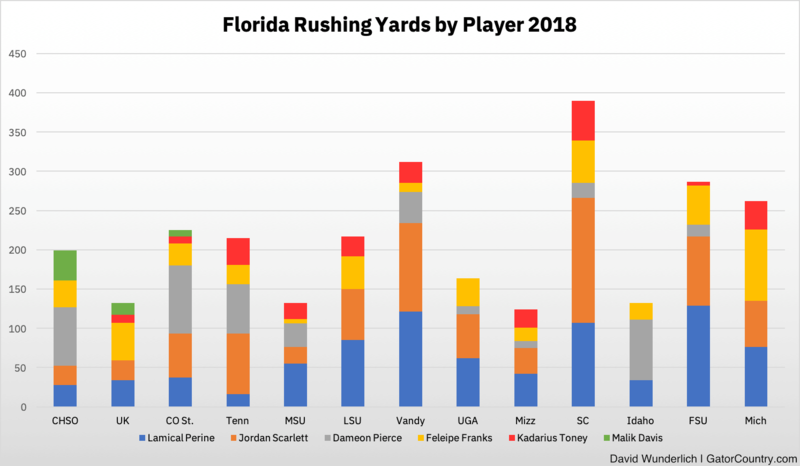 Florida’s run game is totally set when it comes to the ball carriers in 2019. That line, though. That’s the real question.